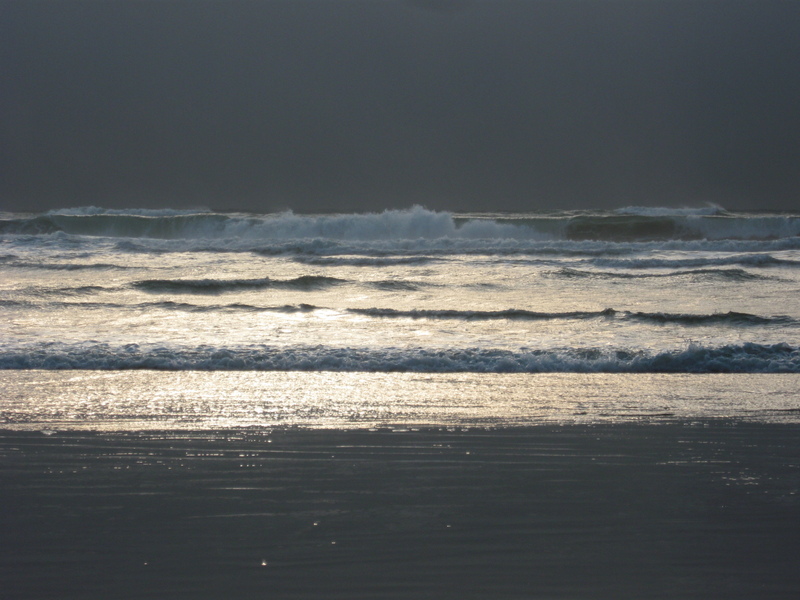 The ocean sings a brilliant song tonight in Yachats, like a Greek chorus in full voice. I sit by the woodstove fire: the smokey scent, running waves, brisk wind coming off the ebony water inform me that I am inarguably alive. On the south central coast of Oregon I have found territories known for years and yet they seem new to me still. A four mile hike through scrubby woods to find gentle sand dunes; a climb amid volcanic rocks to discover amber agates and sea urchins; a stop in historic Florence for a meal, good coffee, and a stroll. It was there that I was called by a necklace made of brass, blue and green inks, and epoxy. It is reminiscent of a mandala, or the wheel of life. It surprised me with its vibrant symmetry and textures. The pendant reflects a sense of the eternal, much as nature does, and that is central to what matters to me. Ten years ago this date I was awaiting surgery, as well as remarriage (after divorce many years earlier) to my husband. And before either came to pass, 9/11 happened to us all. I was up early that morning to go to the dentist when I noted that there were several messages from my oldest daughter. I got the next call. I had never heard her pierced with such anguish as she told me what was happening. And my sister-in-law was in the Pentagon when it was hit by one of the planes. We waited all day until we got word she had raced out in time, smoke and terror and chaos chasing her. Everywhere I went that day people were weeping uncontrollably. Disbelief and horror brought us to our knees at the church across the street, strangers alongside neighbors. Two days later we decided to go ahead with the marriage. My husband-to-be, a few family members and I set off for the courthouse for a civil ceremony. I gasped for breath from the walk up a small hill, and dearly hoped the familiar burning sensation in my chest would pass, that no clenching chest pain would disturb the event. It was a quiet group that assembled. When we stood before the judge she noted that marrying us was the best thing to happen all week. A pall covered us momentarily. I also secretly worried a bit that it might be the one good thing to happen to me for months if not years to come. It seemed a strange if beneficent thing to experience, considering what had just come to pass for our country and myself–and what was before us collectively and privately. This is how my thinking can be when I mistake a significant event as the most defining moment of all. I suppose we each do that, and usually it is for very good reasons: a milestone, a tragedy, a turning point that is precipitated by a failure or success. But those days before and after the stent implant were molded by all of those and more. It was easy to reconsider who I was, and to conclude I was a woman forever marked by not only defeats and triumphs over a lifetime but also by a diagnosis. Coronary artery disease. It sounded and felt decidedly like an enemy. I believed it had already changed me beyond recognition in many ways. The first day I went to cardiac rehab I felt anxious and alone. Everyone around me was at least ten to twenty years older. They seemed sicker, as well. Wanting only to leave, I got on the treadmill and worked up a sweat. My pulse was taken at intervals by the nurse, my chest tightened and then expanded more easily. My mind was focused on one thing only: I would not die of CAD this day. In fact, I had to get healthier. Stronger. And also grateful–for the challenge, for all I still valued. For life amidst the brokeness of the world and the frailties of humanness. I am simply one person with a health condition; it doesn’t get to dictate the whole narrrative. After all, as a species we are good at finding purchase again on the rockiest of paths. We mend what has been damaged. We endure, can and do regain our dignity. Despite the progress and prayers the next couple years, the identity that wanted to persis, however, was Heart Patient. I carried all the vital information in my wallet “just in case” and saw it as more important than my name. Nitroglycerin accompanied me everywhere; it was the amulet, the lifesaver I feared living without. It took more than imagined to overcome the diagnosis and the label. I was worried it meant I was less than, weaker than, defective and therefore not as capable. No one had warned me of these intangible side effects. I could see I needed to be fearless, to live more in faith so I set myself to the task. That is when transformation picked up speed. With each 911 call lived through, each walk and hike more demanding and pleasurable, and every important person in my life offering support, I rediscovered the core of who I was: altered but not truly different than before. For I am certain who I am. I will blink in the face of difficult times but I will not long close my eyes. Call me greedy for life: give it all to me. When I mistook myself for a minor invalid, the specter of self-pity hovered and made the task of living well that much more daunting. Stepping out and away from the familiarity of my losses cracked open my world and the wiser world we share. The dynamic beauty of it infused me with numinous energy once again. Who we are is who we want–and choose–to be. My sister-in-law seems near tonight although she is with the Washington Chorus, along with my brother, performing at a commemoration at Trinity Wall Street sancutary and St. Pauls’ Chapel, New York City. She survived the heinous attack. Truly, she is a humble, heart-centered and joyous being. Both she and my brother are examples of what we can do with what is given. 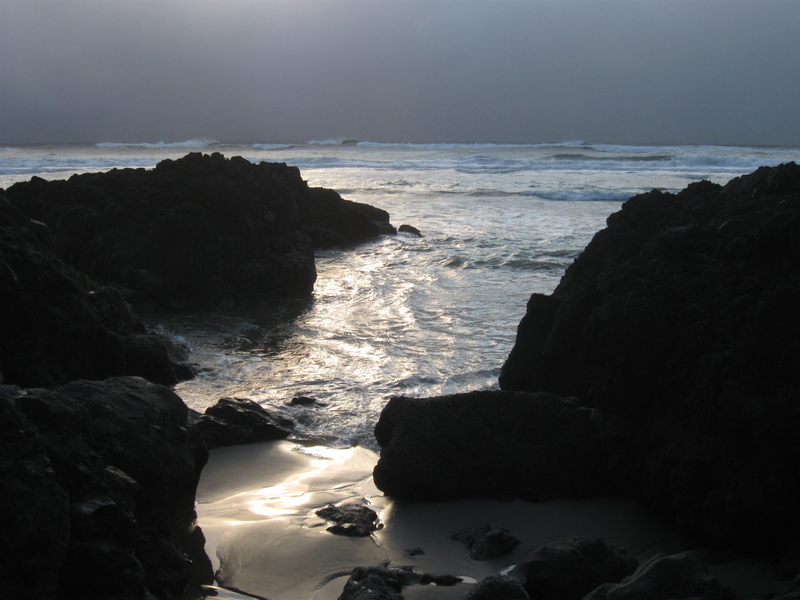 Here in Yachats, the Pacific Ocean is a constant symphony of wonder on a gentle night. I am filled with quietude. Blessings on everyone, both here and gone. lovely writing, as usual…I feel just as you do about the woods, the ocean, the wonder of nature that we tend to forget in our daily rush. Thanks again for the comments; I am glad you enjoy my work. And the glories of nature, as we agree, are always worth writing about!